Me: Are these easy to fit? I've never done it before and don't really know what I'm doing. Bike shop man: Yeah it's easy, you'll have no problem at all. So I took my shiny new bike parts home with me and set to work dismantling my bike only it wasn't quite as easy as the bike shop man had me believe. Things quickly went wrong, I got stressed and now my bike is in pieces dumped at the bike shop for them to sort out the mess. While my bike was out of action I turned to something far less stressful than amateur mechanics -making pasta. Smoked salmon linguine is a regular feature in my house, it's cheap, quick, simple to make and most importantly of all delicious. I chose to use linguine pasta, I don't know why but it just seems to suit seafood, you could of course use any pasta you fancy. 1,2 or more cloves of garlic very finely chopped. 300g linguine or other pasta of you choice. 200ml Cremé fraiche (substitute sour cream or double/heavy cream). 150g smoked salmon chopped into small pieces. 1 bag (about 80g) rocket leaves. Good olive oil for drizzling. In a large frying pan on a low heat fry the onion and garlic, meanwhile put a large pan of water on to boil for the pasta. Once the water is boiling add your pasta to the pan and cook according to the instructions on the packet. While the pasta is cooking the onions should have softened, at this point add the créme fraiche and mix everything together. It will probably be too thick, it it is add some of the pasta water until you get the right consistency. Add lemon juice and black pepper to taste. Once the pasta has cooked stir the smoked salmon into the sauce, take the pasta out of it's cooking water and add to the pan with the sauce. mix well. Finally stir in the rocket leaves reserving a few for garnish. serve drizzled with olive oil and scattered with rocket leaves. Lovely - nice and simple but really delicious. I like linguine with fish too. 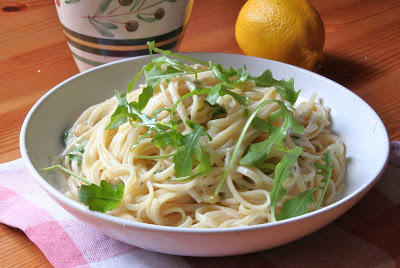 Wish I had a bowl of this now - it is lunchtime and the cupboards are rather bare! I know what I would find easier to do and it has nothing to do with bikes! Looks delicious Sam! When the bike shop dude says, "no problem--it's easy," just run the other way. I had a roommate who would say, "hey wanna go do (something obnoxious)? Come on; it'll be fun." That "it'll be fun" was always the kiss of death! Hope you get your bike back soon, and in one piece. Well..they are the pros =P Pasta is always simple and yummy! Love the smoked salmon! This looks lovely! The only thing I've done differently when I make it is add a spoonful of capers. Much less stressful than DIY on the bike. i sooo love smoked salmon pasta.. Hey thank for this one..
Love it. Simple and with smoked salmon...a staple in our house (norwegian husband). It's great to have a delicious and quick pasta dish in your repertoire. Mmm... pasta & seafood... always a great combination!